September has been National Arthritis Awareness Month in Canada, so we’re going to co-opt it for our own purposes and raise awareness for arthritis as it afflicts our pets. 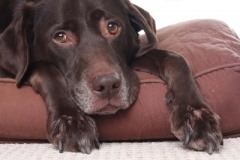 Our pets can develop arthritis just as we do, as it is not a condition limited to humans. Arthritis, for those unaffected by it, is an ailment affecting joints that causes pain, stiffness and inflammation. These indicators can have a significant impact on one’s ability to perform daily tasks. The same is true for our pets, so monitoring their capability to carry out their daily activities is a great way to look for the onset of arthritis. Make An Appointment With Your Vet. If you have noticed the above symptoms in your pet or suspect the onset of arthritis for other reasons, the first step is to consult your veterinarian. An examination and testing can help determine the extent of the current condition and your veterinarian can work with you to develop a plan that suits the care needs of an individual pet. This can include helping you select the right diet, as well as what drugs (painkillers / anti-inflammatories) and supplements that will assist in managing your pet’s condition. To manage your pet’s arthritis at home, there are several ways that you can make life more comfortable. Feeding the right diet and maintaining the proper weight for your pet is essential, as extra pounds are hard on the joints. Another way to ease the load on the joints is to regularly exercise but ensure that it’s low-impact activity for short periods. Running up and down a flight of stairs or jumping is heartily not recommended. Similarly, try to reduce the need for stairs for your pet, keeping their food and/or litter all on one floor when able. If you have the access, probably the best possible exercise for a pet with arthritis is swimming. Afterward, most pets find nothing more soothing than a massage. Catching the condition early will improve your chances of successfully managing it, and thus improving everyone’s quality of life. Weight and diet go a long way toward ensure your pet lives a long and healthy life, and perhaps even a pain-free one. Maintaining a healthy weight on a vet-approved diet can either delay or sometimes prevent the onset of arthritis by ensuring that the joints aren’t stressed beyond their natural ability. Providing your pet with the opportunity for regular activity and exercise is also a great way to help keep arthritis at bay, as it keeps the joints moving and strengthens the muscles around them to help them work more smoothly. High-impact activities should perhaps still be kept to a minimum, however, particularly during youth. It should be noted though that some types of arthritis are genetic conditions, which cannot be prevented, although onset can be delayed and managed with early detection. For more information on arthritis and how it affects your pet, or to book an appointment to review any of the symptoms above, contact your veterinarian today.